BONUS MICROPOLL is now successfully running for more than one year. A lot was achieved since when it started in July 2017. All working groups worked closely together to proceed in the working plan. The progress of the project is presented in the summary report. Moreover, all project aims were achieved in time and can be downloaded here. We are looking forward to the following years of successful research and interesting findings in the field of marine microplastic science. From research directly into practice! BONUS MICROPOLL was very pleased to welcome guests to the End-User Forum in the IOW. 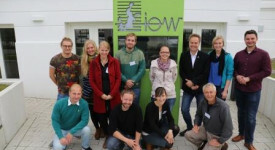 Several microplastic projects shared their scientific progress with representatives of state authorities and stakeholders, in particular on sampling and processing as well as avoidance strategies. Besides lectures about the methodological work and the corresponding discussion at the round table, a practical demonstration took place at the beach of Warnemünde to illustrate litter monitoring on the beach. 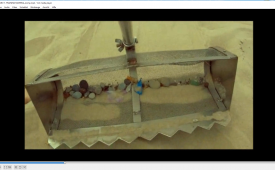 A video with teaching material of different cost effective and easy to follow methods applied for marine litter samplings around the beaches of the Baltic Sea was developed. The methods shown are focusing mostly on larger micro-litter (> 2 mm – 5 mm) and meso-litter (> 5 – 25 mm). The Rake-method covers the whole width of the beach between the waterline and the vegetation, cliff etc. while the goal of the Tidal method is to survey beach wrack that washed up along the beach after stormy events. Additionally, the 100m OSPAR method is presented, a naked eye method investigating macro-litter (> 25 mm) on the surface of the beach. 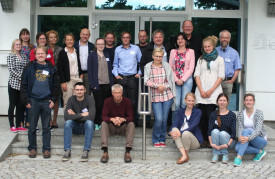 26 members from all 7 project partners participated in the meeting, hosted by IVL at the scenic Swedish west coast. Every partner gave updates about their activities in the first project year, followed by constructive discussions on current and upcoming tasks. Selected topics comprise the methodologies for processing and analysing microplastics, the use of natural control particles in experiments, dissemination and microplastic avoidance measures, and the upcoming first progress report. The project can offer a positive summary of its first year, and several joint experiments are planned for the second year. One highlight of the meeting was the seafood dinner with picturesque views, followed by a dip in the refreshing Baltic Sea. 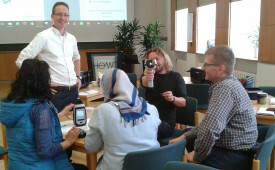 On the 12th of October, partners from Lithuania, Poland, and Germany took part in a workshop on the use of the microPHAZIR PC (Thermo Fisher Scientific). The device applies near-infrared spectroscopy to rapidly identify 30 different polymer types, covering a spectral range of 1600 - 2400 nm. It can be used to analyze plastic particles >1mm and will mostly be applied in the beach monitoring. First test samples were analyzed already during the workshop. The event took place in the Leibniz Institute for Baltic Sea Research and was carried out by the company analyticon as in-kind contribution. 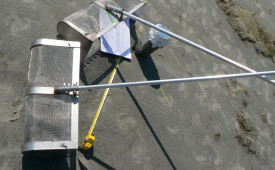 In the course of BONUS MICROPOLL, beach samples will be taken along the whole coast of the Baltic Sea. The first beach litter sampling took place in July. Partners from Klaipeda University surveyed different beaches in Lithuania, Latvia and Estonia. 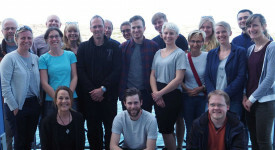 Partners from the IOW sampled for two weeks along the Swedish mainland coast and at the island Öland. Up to now, around 70 samples from around 30 sandy beaches were taken with the Rake method (Haseler et al. 2017, Journal of Coastal Conservation), focusing on meso and large microlitter items. Subsamples of the beach sediments were taken for analysis of the smaller microlitter fraction. 25 members from 6 project partners (out of 7) took part in the first meeting of BONUS MICROPOLL. Presentations were given by the Advisory Board members Gunnar Gerdts (AWI) and Kara Lavender Law (SEA), sharing their longstanding experience with microplastic projects. All project partners gave overviews of their planned activities, followed by discussing and organizing the sampling campaigns, database and model input, and other linkages within the project. During dinner the opportunity was taken to socialize and develop further collaborations within the project. 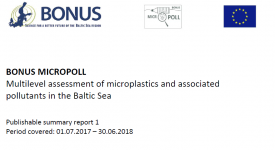 BONUS MICROPOLL has received funding from BONUS (Art 185), funded jointly by the EU and Baltic Sea national funding institutions.